Easy Dirt Skirt - Now available and can be cut to fit any size EASYBOOT. The pad of light 1" thick urethane sheet foam provides extra cushioning and keeps dirt, rocks, and other debris out of your Easyboots. Easy Foam Kit - The new reformulated Easy Foam consists of two liquid components. When mixed and poured into an Easyboot before fitting, EasyFoam expands to make an exact fitting flexible liner. 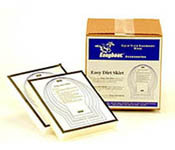 EasyFoam seals out all dirt and debris, cushions and protects the hoof, and acts as an adhesive. EasyFoam is recommended for horses used in extreme conditions such as competitive long distance events, deep mud or rocky terrain. 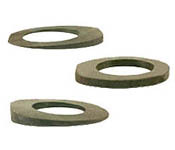 Easyboot Studs - Long wearing studs (3 per boot) can be easily attached to any boot to provide traction on asphalt, ice or other hard or slippery surfaces. 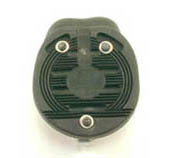 The studs may be removed when their application is no longer necessary, and replaced as needed. Keeper Straps - Keepers are a two-piece set of 1" nylon webbing; one double-ended loop is installed around the inside back strap of the boot, with the other piece attaching around the pastern with a Velcro fastener. These can be useful on trail rides or through water, particularly during initial fitting rides. 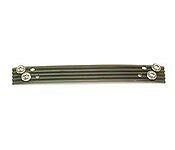 We do not recommend the use of keeper straps on flighty or fast-going horses, of course. Replacement Inside Strap (backstrap)- Unlike the Easyboot, whose durability improves as it cures with age, the softer, more flexible material used in the backstraps can become cracked and brittle over time. Replace an old, cracked or torn inside backstrap with a new, soft, pliable backstrap anytime. No special tools (other than a screwdriver) required. Please specify Easyboot size when ordering and whether you need replacement side screws (no extra charge). Replacement Cables & Buckles - Hard riding in rough terrain can sometimes result in frayed or broken cables and damaged boot buckles. Fortunately, a broken cable does not mean the end of the line for your Easyboot. 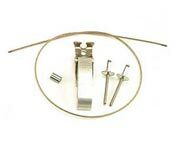 New cable & buckle kits are available from EasyCare. Either install yourself (access to a pop-rivet gun is necessary), or ship your Easyboot back to us for installation. Please specify Easyboot size when ordering. 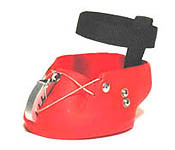 Easyboot Wedges - Used to help treat navicular disease, bowed tendons, etc. Heel & Toe pads raise the heel or toe 1/3 inch. Flat pads used with Easyboots are good for lifting the hoof to allow for a better Easyboot fit. Removable. Please specify size of each boot and heel, flat or toe. Black only. Toe - For use with Easyboots only. Hoof Pads - Hoof pads are made from tough, durable, shock absorbing urethane. These pads are for use with shoes or can be trimmed for Easyboots. Black only. It is a huge misconception that when riding “you don't use your feet, so why care about your stirrups.“ Well, ask anyone who has spent 12-24 hours in a saddle and you will find out that foot comfort and support is one of the major issues in long distance riding. E-Z Rides were developed with the foot and body in mind. They are lightweight and durable, but it's their extra wide and deep design that allows the foot the room it needs to help distribute the weight properly. Over long distances or long hours this weight distribution aids in circulation throughout the foot plus gives relief to the knees and lower back with its thick foot cushion. They are great for riders with existing foot, knee or lower back problems.